It contains Rhodochrosite, Purple Aura Quartz Crystal wrapped in copper wire, Shungite powder, Sage, Rose Petals, Mica Flakes, 24 K gold flakes, Metal shavings (brass), Copper coil, Black Sun Iron Oxide nano powder, jewelry grade epoxy resin. Comes on a 29" Stainless Steel necklace with lobster clasp. Purple aura lemurian quartz magnify your prayers, intentions, and desires, and purify them before they send them straight up to Source. This is pure light! Purple Aura quartz has become one of my favorite tools. This extraordinary, sparkling variety of quartz is quite challenging to find, but well worth the hunt. Each piece is a magical, shimmering, angelic point, with rainbows bursting out in all directions. Purple aura is created when pure solid gold, indium, and occasionally niobium are bonded to clear quartz. 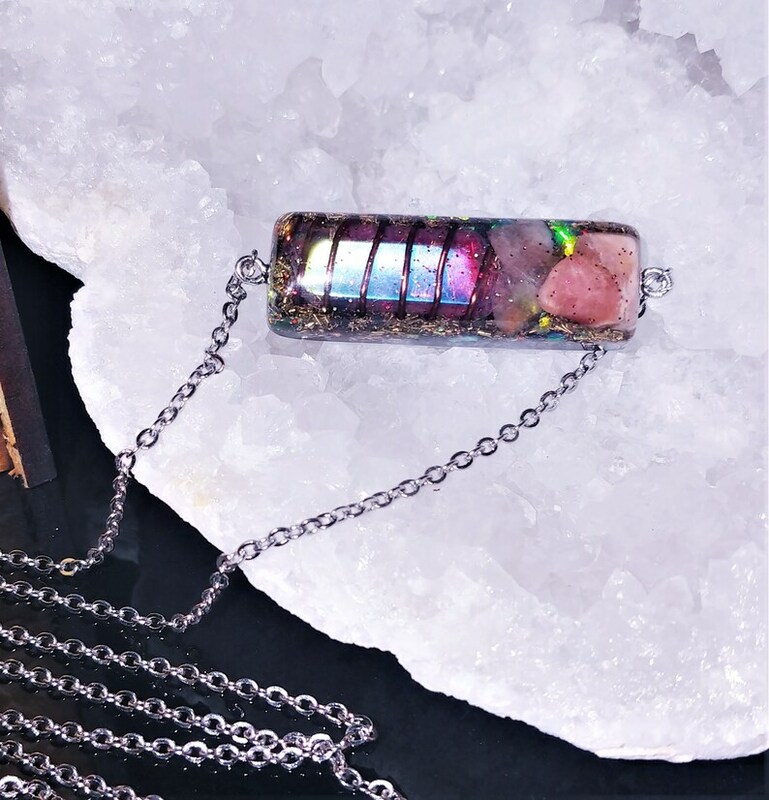 These pieces, with their iridescent reflection of brilliant rainbows, stimulate both body and spirit through their powerful vibrations. It is a gemstone which facilitates communication and connection with Higher Realms, with our guides, and with our past lives. Aura quartz will guide you beyond the Veil, opening the Crown Chakra, to develop and expose a whole new level of psychic and intuitive awareness. I use mine in meditation, and they truly facilitate strong spirit contact. And, they are absolutely magical to look upon. There are many colors of aura quartz. Purple aura in particular resonates with the Third-Eye and Crown Chakras. Use this purple aura quartz generator at the center of your spiritual connection grid or altar. Or hold it in meditation when calling in your guides, or opening the Crown Chakra. Orgone device is a substance which functions as a self-driven, continuously-operating, highly efficient energy transmutation device, drawing in negative life energy and transmuting it into positive energy. It is reputedly protects one from harmful EMF radiation. Some people feel increased energy and a greater sense of well being when wearing or being in the vicinity of orgone. Orgone is made with metal shavings and epoxy resin. Quartz and copper are popular ingredients due to their conductive properties. The resin is poured over the quartz and metal shavings, and it shrinks as it hardens, exerting pressure on the quartz, permanently squeezing the quartz crystal inside which creates a well-known piezoelectric effect inside the crystal, meaning its end-points become polarized electrically, this apparently causes it to function more effectively as a positive energy generator. Having an orgone product on you is like having an energy transformer in your energy field. It will clean up stuck or armored energy structures in your energy field. Of course, how much it will be effective also depends how old and strong the armored energy structures are. Orgone can be effective immediately or it might take a long time. But it is always working. How to identify that Orgone is working? Sensitive individuals will feel the heat and light tingling radiating from the Orgone. Some people may experience increase of energy levels. Please keep in mind that orgone is a handmade resin product, during the curing process some inclusions, imperfections, bubbles or texture variations can occur but this in no way affects the quality or function of the orgone device. I absolutely love this necklace! It’s just as pictured but even more beautiful In person! You can definitely tell the person that made this put a lot of time and love into making this piece! She even included a beautiful thank you note and gift! I will definitely be ordering from her again! Thanks a bunch! Beautiful!